Inspector blogging: Doing a proper job. I've just been looking at the Office of National Statistics website. It's very thorough. But it does use a lot of acronyms. One of the acronyms is IDACI. It stands for "Income Deprivation Affecting Children Index". It is a figure that gets lower as the number of children who, for whatever reason, don't have what they need gets higher. I remember one child I met. This lad must have been about three; a cheeky little chap who was rocking the saggy nappy, grubby dummy outfit as he strutted barefoot into the room. He also looked pretty proud of his body art; an oddly orange patch down his front with pale streaks where the dummy couldn't quite stop the dribble dripping onto his tummy. If he is still with us he will be in his 30s by now. We remember the children we meet. We safeguard them as best we can as police officers. There are more officers than people may think who go that extra mile. This is one of them. 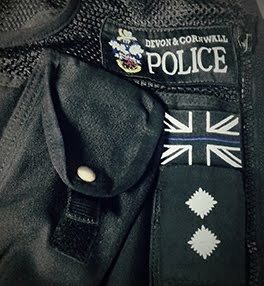 "As a former housing officer this officer was already aware of the high levels of poverty that existed in some parts of Cornwall when she joined the police. During her work as a front line Patrol Officer she again saw first hand the effects of poverty on the young. At work she conscientiously fulfilled the Force Mission to protect the vulnerable. But not being content to limit her compassion to work hours, this officer decided to do something for the families she saw struggling to provide for their children. Drawing upon her experience with community action groups and charities, in June 2016 she started her own community action group “Little Wrens Wardrobe”. Using crowd funding she was able to rent a small industrial unit on a nearby industrial estate. By sheer hard work, dedication and raw energy, as well as her considerable persuasive skills, she established a network of donors and up to 15 volunteers to gather and sort through clothing, equipment, books and toys. The idea was to respond to the needs of distressed families by taking referrals from professionals and volunteer organisations who worked with vulnerable families and children. It was not long before news of Little Wrens Wardrobe spread with referrals coming from social services, mental health workers, domestic violence advocates, drugs and addiction support workers and hostels. Parents escaping violence, with mental health difficulties, addictions or simply going through a bit of a rough patch are amongst those helped. In addition Little Wrens Wardrobe held three free “thrift shop” events; events that would be respectful and accepting of those who came to use the service for free. This officer works hard to break down the barriers that may stop someone asking for help. She keeps her work and Little Wrens personas separate so as not to deter those she has had cause to deal with when in uniform. The service is available to anyone in North Cornwall, and so far families from Bodmin, Wadebridge, Launceston, Camelford and Bude have been helped. It is impressive how this officer has dedicated herself to building the capacity of Little Wrens Wardrobe. This community group has responded to over 400 referrals from numerous statutory partners, run free “book hunts” for children during holidays, raised over £8000 pounds and is well into an 8 week process to apply for charitable status with the Charities Commission." Now that's what I call a proper job. PS - Please, please drive carefully. Be kind to each other. Don't mess with other people's stuff.